Perhaps the last thing an employee wants to do after a 12-hour shift is drive for an hour to get home. But for 1700 Western Australian construction workers, this hasn’t been a problem. Veolia Transport WA has bussed employees to and from work safely each day for years, with some workers even using the ride as an excuse for a quick snooze. For its efforts, Veolia, which operates South West Coach Lines, has been recognised as the number one contractor at BHP Billiton Worsley Alumina’s recent Safety, Environment, and Community Awards. Veolia Transport General Manager Lisa Shreeve says Veolia was honoured to receive the award, as safety has always been its number one priority. "Every day we were responsible for thousands of people getting to work and getting home safely," she says. "When we wake up in the morning that’s what we think about." But she says despite the great partnership Veolia has enjoyed with Worsley, there are still companies not thinking about safe work travel. "We worked really closely with Worsley on producing the best service network for specific needs, so we didn’t have any passenger injuries throughout the whole project," she says. "But there are lots of different companies that have over 100, 200, or 300 workers, and they don’t think about getting their staff to work safely." "We are very keen to look at any partnerships we can develop with those sort of businesses to see what we can do to reduce the pressure on staff having to travel long distances." Veolia Transport WA Bunbury Depot Manager Susan Coetzee acknowledged the award on behalf of the staff involved in the project. "We worked very closely with Worsley to find car parking near private homes, multiple pick up points around Bunbury ensured buses departed within 15 minutes from the site, and most importantly, we got everyone home safely," she says. "At peak, 56 percent of workers used the bussing services, which reduced traffic volume on the Coalfields Highway to and from work, and reduced fatigue related issues." She says Worsley provided various incentives to encourage people to use the bus services. "A number of passengers said they were able to relax and even sleep on the way home from work," Coetzee says. 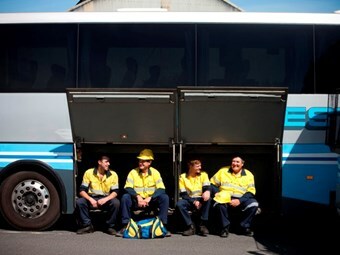 Bussing was introduced to alleviate traffic and road safety risks for workers travelling to and from Marradong mine operations in Boddington and the Collie refinery. Veolia Transport was awarded the contract, and, at peak, 45 buses serviced the refinery, and seven serviced the Marradong mine operations in Boddington.